Rapid-fire questions for one of Australia’s best-known broadcasters and journalists. Mike Carlton has been a war correspondent, political reporter, a TV news and current affairs reporter, an award-winning radio presenter in both Sydney and London, an outspoken newspaper columnist and a biting satirist. In later life he realised a lifelong ambition – to write three bestselling books of Australian naval history. Mike has spent his career asking the hard questions and diving deep into the answers, so to change things up, we’ve asked him to answer the following as briefly as possible. One thing you never leave home without? Towel and a pair of Speedos. You never know when you might want a swim. One person you’d love to interview, and why? Donald Trump. It would be fascinating to meet one of the worst – if not the worst – presidents in American history. One question always worth asking? Apart from that, Mrs Lincoln, did you enjoy the play? One word or phrase you love, and why? Stomplebomp. It’s the noise my son makes when he plays barefoot soccer on our wooden floors at home. One word or phrase you loathe, and why? Reaching out. It’s the worst of American smarm. One thing you love about your job? One thing you love to do outside of work? Swimming, surfing, paddling my surf ski. One goal you’re working towards? Staying alive a lot longer. One achievement you’re proud of, and why? Writing three best-selling books of Australian naval history. One thing you hope readers take away from On Air? 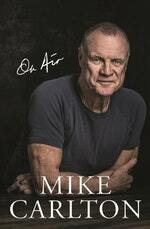 On Air is Mike Carlton's story, no holds barred. The Star-crossed author takes on our rapid-fire questions. Rapid-fire questions for the author of Witches: What Women Do Together.